In discrete emotion theory, all humans are thought to have an innate set of basic emotions that are cross-culturally recognizable. These basic emotions are described as "discrete" because they are believed to be distinguishable by an individual’s facial expression and biological processes. Theorists have conducted studies to determine which emotions are basic. A popular example is Paul Ekman and his colleagues' cross-cultural study of 1992, in which they concluded that the six basic emotions are anger, disgust, fear, happiness, sadness, and surprise. Ekman explains that there are particular characteristics attached to each of these emotions, allowing them to be expressed in varying degrees. Each emotion acts as a discrete category rather than an individual emotional state. Humans' subjective experience is that emotions are clearly recognizable in ourselves and others. This apparent ease of recognition has led to the identification of a number of emotions that are said to be basic, and universal among all people. However, a debate among experts has questioned this understanding of what emotions are. There has been recent discussion of the progression on the different views of emotion over the years. On "basic emotion" accounts, activation of an emotion, such as anger, sadness, or fear, is "triggered" by the brain's appraisal of a stimulus or event with respect to the perceiver's goals or survival. In particular, the function, expression, and meaning of different emotions are hypothesized to be biologically distinct from one another. A theme common to many basic emotions theories is that there should be functional signatures that distinguish different emotions: we should be able to tell what emotion a person is feeling by looking at his or her brain activity and/or physiology. Furthermore, knowledge of what the person is seeing or the larger context of the eliciting event should not be necessary to deduce what the person is feeling from observing the biological signatures. On "constructionist" accounts, the emotion a person feels in response to a stimulus or event is "constructed" from more elemental biological and psychological ingredients. Two hypothesized ingredients are "core affect" (characterized by, e.g., hedonic valence and physiological arousal) and conceptual knowledge (such as the semantic meaning of the emotion labels themselves, e.g., the word "anger"). A theme common to many constructionist theories is that different emotions do not have specific locations in the nervous system or distinct physiological signatures, and that context is central to the emotion a person feels because of the accessibility of different concepts afforded by different contexts. Eugene Bann proposed a theory that people transmit their understanding of emotions through the language they use that surrounds mentioned emotion keywords. He posits that the more distinct language is used to express a certain emotion, then the more distinct the perception (including proprioception) of that emotion is, and thus more basic. This allows us to select the dimensions best representing the entire spectrum of emotion. Coincidentally, it was found that Ekman's (1972) basic emotion set, arguably the most frequently used for classifying emotions, is the most semantically distinct. For both theoretical and practical reasons researchers define emotions according to one or more dimensions. Wilhelm Max Wundt, the father of modern psychology, proposed in 1897 that emotions can be described by three dimensions: "pleasurable versus unpleasurable", "arousing or subduing" and "strain or relaxation". In 1954 Harold Schlosberg named three dimensions of emotion: "pleasantness–unpleasantness", "attention–rejection" and "level of activation". Dimensional models of emotion attempt to conceptualize human emotions by defining where they lie in two or three dimensions. Most dimensional models incorporate valence and arousal or intensity dimensions. Dimensional models of emotion suggest that a common and interconnected neurophysiological system is responsible for all affective states. These models contrast theories of basic emotion, which propose that different emotions arise from separate neural systems. Several dimensional models of emotion have been developed, though there are just a few that remain as the dominant models currently accepted by most. The two-dimensional models that are most prominent are the circumplex model, the vector model, and the Positive Activation – Negative Activation (PANA) model. The circumplex model of emotion was developed by James Russell. This model suggests that emotions are distributed in a two-dimensional circular space, containing arousal and valence dimensions. Arousal represents the vertical axis and valence represents the horizontal axis, while the center of the circle represents a neutral valence and a medium level of arousal. In this model, emotional states can be represented at any level of valence and arousal, or at a neutral level of one or both of these factors. Circumplex models have been used most commonly to test stimuli of emotion words, emotional facial expressions, and affective states. Russell and Lisa Feldman Barrett describe their modified circumplex model as representative of core affect, or the most elementary feelings that are not necessarily directed toward anything. Different prototypical emotional episodes, or clear emotions that are evoked or directed by specific objects, can be plotted on the circumplex, according to their levels of arousal and pleasure. The vector model of emotion appeared in 1992. This two-dimensional model consists of vectors that point in two directions, representing a "boomerang" shape. The model assumes that there is always an underlying arousal dimension, and that valence determines the direction in which a particular emotion lies. For example, a positive valence would shift the emotion up the top vector and a negative valence would shift the emotion down the bottom vector. In this model, high arousal states are differentiated by their valence, whereas low arousal states are more neutral and are represented near the meeting point of the vectors. Vector models have been most widely used in the testing of word and picture stimuli. The positive activation – negative activation (PANA) or "consensual" model of emotion, originally created by Watson and Tellegen in 1985, suggests that positive affect and negative affect are two separate systems. Similar to the vector model, states of higher arousal tend to be defined by their valence, and states of lower arousal tend to be more neutral in terms of valence. In the PANA model, the vertical axis represents low to high positive affect and the horizontal axis represents low to high negative affect. The dimensions of valence and arousal lay at a 45-degree rotation over these axes. Robert Plutchik offers a three-dimensional model that is a hybrid of both basic-complex categories and dimensional theories. It arranges emotions in concentric circles where inner circles are more basic and outer circles more complex. Notably, outer circles are also formed by blending the inner circle emotions. Plutchik's model, as Russell's, emanates from a circumplex representation, where emotional words were plotted based on similarity. There are numerous emotions, which appear in several intensities and can be combined in various ways to form emotional "dyads". The PAD emotional state model is a psychological model developed by Albert Mehrabian and James A. Russell to describe and measure emotional states. PAD uses three numerical dimensions to represent all emotions. The PAD dimensions are Pleasure, Arousal and Dominance. The Pleasure-Displeasure Scale measures how pleasant an emotion may be. For instance both anger and fear are unpleasant emotions, and score high on the displeasure scale. However joy is a pleasant emotion. The Arousal-Nonarousal Scale measures the intensity of the emotion. For instance while both anger and rage are unpleasant emotions, rage has a higher intensity or a higher arousal state. However boredom, which is also an unpleasant state, has a low arousal value. The Dominance-Submissiveness Scale represents the controlling and dominant nature of the emotion. For instance while both fear and anger are unpleasant emotions, anger is a dominant emotion, while fear is a submissive emotion. In 2011, Lövheim proposed a direct relation between specific combinations of the levels of the signal substances dopamine, noradrenaline and serotonin and eight basic emotions. A three-dimensional model, the Lövheim cube of emotion, was presented where the signal substances forms the axes of a coordinate system, and the eight basic emotions according to Silvan Tomkins are placed in the eight corners. Anger is, according to the model, for example produced by the combination of low serotonin, high dopamine and high noradrenaline. Lövheim wrote that as neither the serotonin nor the dopamine axis is identical to the "pleasantness" (i.e. valence) dimension in earlier theories, the cube seems somewhat rotated when compared to these models. Cowen & Keltner provide an interactive map demonstrating the smooth gradients of intermediate emotional states that link a variety of emotion categories. Ethnographic and cross-cultural studies of emotions have shown the variety of ways in which emotions differ with cultures. Because of these differences, many cross-cultural psychologists and anthropologists challenge the idea of universal classifications of emotions altogether. Cultural differences have been observed in the way in which emotions are valued, expressed, and regulated. The social norms for emotions, such as the frequency with or circumstances in which they are expressed, also vary drastically. For example, the demonstration of anger is encouraged by Kaluli people, but condemned by Utku Inuit people. The largest piece of evidence that disputes the universality of emotions is language. Differences within languages directly correlate to differences in emotion taxonomy. Languages differ in that they categorize emotions based on different components. Some may categorize by event types whereas others categorize by action readiness. 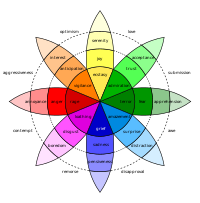 Furthermore, emotion taxonomies vary due to the differing implications emotions have in different languages. That being said, not all English words have equivalents in all other languages and vice versa, indicating that there are words for emotions present in some languages but not in others. Emotions such as the schadenfreude in German and saudade in Portuguese are commonly expressed in emotions in their respective languages, but lack an English equivalent. Some languages do not differentiate between emotions that are considered to be the basic emotions in English. For instance, certain African languages have one word for both anger and sadness, and others for shame and fear. There is ethnographic evidence that even challenges the universality of the category "emotions" because certain cultures lack a specific word relating to the English word "emotions". Ekman, P. (1972). Universals and cultural differences in facial expression of emotion. In J. Cole (Ed. ), Nebraska Symposium on Motivation. Lincoln, Nebraska: University of Nebraska Press: pp. 207–283. Ekman, P. (1992). "An argument for basic emotions". Cognition and Emotion. 6 (3): 169–200. CiteSeerX 10.1.1.454.1984. doi:10.1080/02699939208411068. Ekman, P. (1999). Basic Emotions. In T. Dalgleish and T. Power (Eds.) The Handbook of Cognition and Emotion Pp. 45–60. Sussex, U.K.: John Wiley & Sons, Ltd.
Fontaine, J.; Scherer, KR; Roesch, EB; Ellsworth, PC (2007). "The world of emotions is not two-dimensional". Psychological Science. 18 (12): 1050–1057. CiteSeerX 10.1.1.1031.3706. doi:10.1111/j.1467-9280.2007.02024.x. PMID 18031411. Freitas-Magalhães, A. (2009). Emotional Expression: The Brain and the Face. Porto: University Fernando Pessoa Press. Koelsch, S.; Jacobs, AM. ; Menninghaus, W.; Liebal, K.; Klann-Delius, G.; von Scheve, C.; Gebauer, G. (2015). "The quartet theory of human emotions: An integrative and neurofunctional model". Phys Life Rev. 13: 1–27. doi:10.1016/j.plrev.2015.03.001. PMID 25891321. Sugu, Dana; Chaterjee, Amita (2010). "Flashback: Reshuffling Emotions". International Journal on Humanistic Ideology. 3 (1). Russell, J.A. (1979). "Affective space is bipolar". Journal of Personality and Social Psychology. 37 (3): 345–356. doi:10.1037/0022-3514.37.3.345. Russell, J.A. (1991). "Culture and the categorization of emotions" (PDF). Psychological Bulletin. 110 (3): 426–50. doi:10.1037/0033-2909.110.3.426. PMID 1758918. Archived from the original (PDF) on 2016-03-04. Retrieved 15 December 2015. ^ a b Ekman, Paul (1992). "An Argument for Basic Emotions". Cognition and Emotion. 6 (3/4): 169–200. CiteSeerX 10.1.1.454.1984. doi:10.1080/02699939208411068. ^ Gendron, Maria; Barrett, Lisa Feldman (October 2009). "Reconstructing the Past: A Century of Ideas About Emotion in Psychology". Emotion Review. 1 (4): 316–339. doi:10.1177/1754073909338877. PMC 2835158. PMID 20221412. ^ Barrett, Lisa Feldman (2006). "Solving the Emotion Paradox: Categorization and the Experience of Emotion". Personality and Social Psychology Review. 10 (1): 20–46. doi:10.1207/s15327957pspr1001_2. PMID 16430327. ^ Bann, E. Y., Bryson, J. J., The Conceptualisation of Emotion Qualia: Semantic Clustering of Emotional Tweets. (2013). In: Proceedings of the 13th Neural Computation and Psychology Workshop. http://aeir.co.uk/pub/bann_bryson2012.pdf. ^ W.M. Wundt, Outlines of Psychology. (1897). In: Classics in the history of psychology. http://psychclassics.asu.edu/index.htm Archived 2001-02-24 at the Wayback Machine, York University 2010, Toronto. ^ Schlosberg, H. (1954). "Three dimensions of emotion". Psychological Review. 61 (2): 81–8. doi:10.1037/h0054570. ^ a b Posner, Jonathan; Russell, J.A. ; Peterson, B. S. (2005). "The circumplex model of affect: An integrative approach to affective neuroscience, cognitive development, and psychopathology". Development and Psychopathology. 17 (3): 715–734. doi:10.1017/s0954579405050340. PMC 2367156. PMID 16262989. ^ a b c d e Rubin, D. C.; Talerico, J.M. (2009). "A comparison of dimensional models of emotion". Memory. 17 (8): 802–808. doi:10.1080/09658210903130764. PMC 2784275. PMID 19691001. ^ Russell, James (1980). "A circumplex model of affect". Journal of Personality and Social Psychology. 39 (6): 1161–1178. doi:10.1037/h0077714. ^ a b Remington, N. A.; Fabrigar, L. R.; Visser, P. S. (2000). "Re-examining the circumplex model of affect". Journal of Personality and Social Psychology. 79 (2): 286–300. doi:10.1037/0022-3514.79.2.286. PMID 10948981. ^ Russell, James; Feldman Barrett, Lisa (1999). "Core affect, prototypical emotional episodes, and other things called emotion: dissecting the elephant". Journal of Personality and Social Psychology. 76 (5): 805–819. doi:10.1037/0022-3514.76.5.805. PMID 10353204. ^ Bradley, M. M.; Greenwald, M. K.; Petry, M.C. ; Lang, P. J. (1992). "Remembering pictures: Pleasure and arousal in memory". Journal of Experimental Psychology: Learning, Memory, and Cognition. 18 (2): 379–390. doi:10.1037/0278-7393.18.2.379. ^ a b Watson, D.; Tellegen, A. (1985). "Toward a consensual structure of mood". Psychological Bulletin. 98 (2): 219–235. doi:10.1037/0033-2909.98.2.219. ^ a b c d Mehrabian, Albert (1980). Basic dimensions for a general psychological theory. pp. 39–53. ISBN 978-0-89946-004-8. ^ Bales, Robert Freed (2001). Social interaction systems: theory and measurement. pp. 139–140. ISBN 978-0-7658-0872-1. ^ Lövheim, H (2011). "A new three-dimensional model for emotions and monoamine neurotransmitters". Med Hypotheses. 78 (2): 341–8. doi:10.1016/j.mehy.2011.11.016. PMID 22153577. ^ Ophelia Deroy (2017). Sensory Blending: On Synaesthesia and related phenomena. Oxford University Press. p. 29. ISBN 9780191660467. ^ Alan S. Cowen,1 and Dacher Keltner (2017-09-05). "Self-report captures 27 distinct categories of emotion bridged by continuous gradients". Proceedings of the National Academy of Sciences. 114 (38): E7900–E7909. doi:10.1073/pnas.1702247114. PMID 28874542. Retrieved 2017-09-11. ^ a b Mesquita, Batja; Nico Frijda (September 1992). "Cultural variations in emotions: a review". Psychological Bulletin. 112 (2): 179–204. doi:10.1037/0033-2909.112.2.179. ^ a b Russell, James (1991). "Culture and Categorization of Emotions" (PDF). Psychological Bulletin. 110 (3): 426–450. doi:10.1037/0033-2909.110.3.426. PMID 1758918. Archived from the original (PDF) on 2016-03-04. Retrieved 15 December 2015. This page was last edited on 9 March 2019, at 17:12 (UTC).